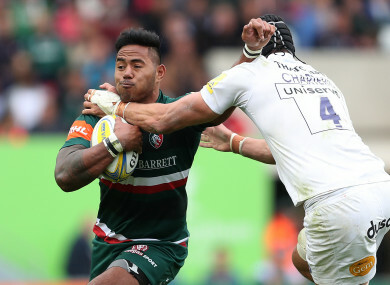 Tuilagi scored on his 100th appearance. LEICESTER ENDED A run of six successive defeats in all competitions with a laboured 19-15 victory at home against Premiership bottom side London Irish on Saturday. Matt Toomua, Jonny May and Manu Tuilagi, on his 100th Leicester appearance, scored the tries that earned the Tigers their first Premiership win since November 19. Joe Cokanasiga and Alex Lewington replied for a resolute Irish side. Leicester chairman Peter Tom had written in his programme notes that “this is not where we want or need to be” after a dreadful run which has included four defeats in the Premiership — three at the one-time fortress of Welford Road. Leicester, underpowered up front and lacking creativity in the backs, looked like a side devoid of confidence and struggled to impose themselves on an Irish side in bottom place with just one win. “Those four points are important but the performance wasn’t there… it wasn’t to our standards,” said Leicester head coach Matt O’Connor. That gave the Sharks a 17-5 lead — Alofa Alofa responding for Quins — but the visitors came back into the contest late in the first period and were ahead through tries from Charlie Walker and Ross Chisholm. The game was not over, however, and Janse van Rensburg crossed the whitewash to set up an exciting finale. The Sharks then went ahead through De Klerk and held on to take a valuable victory. Northampton ended a run of seven successive Premiership defeats as they stunned Gloucester at Franklin’s Gardens. Referee Ian Tempest awarded Saints an 79th-minute penalty try when Gloucester collapsed a maul, which was enough to secure a 22-19 victory. Email “Leicester end run of six straight defeats ahead of final Champions Cup pool games ”. Feedback on “Leicester end run of six straight defeats ahead of final Champions Cup pool games ”.